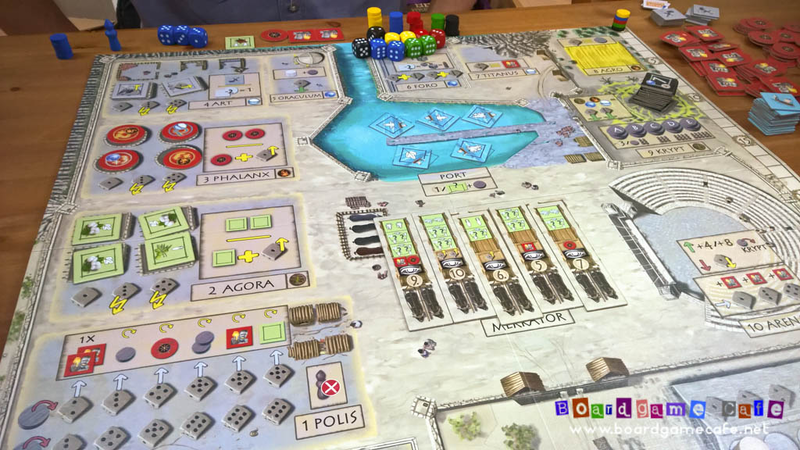 After CLINIC’s sessrep, here’s our take on Bernd Eisenstein’s latest game from last Essen PANTHALOS. Dare you anger the Titans from the Underworld of Greek Antiquity? I first came across the label Iron Games when I was searching for PELOPONNES, a short Civ-themed auction game. I ended up with the French version of the game from Blue Oranges in Essen 2013, only to see them reprinting the English version in 2014. 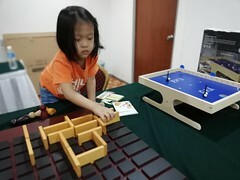 Ah well, the game is language-independent enough to play with the French board. 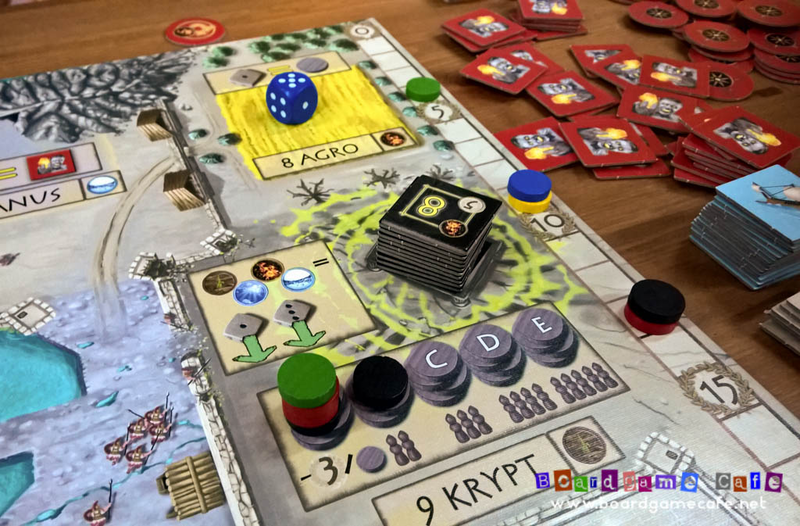 In Essen last year, Kaz happened to observe a 5-player session in play where the group appeared to have “broken” the game in their later rounds, they had ran out of goods tiles to place into Agora (one of the action spots). Has been lingering on our thoughts whether the game is indeed broken? Note: Bernd has since updated the Errata / FAQ to mention you may re-shuffle discarded goods tiles if you have ran out of them and are so inclined to continue providing goods tiles for the rest of the game. 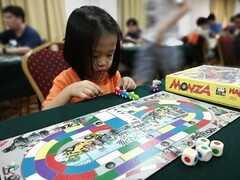 I brought the game to our BGC Retreat last Nov but given the deluge of new games available at the Retreat, this game was not brought to the table. 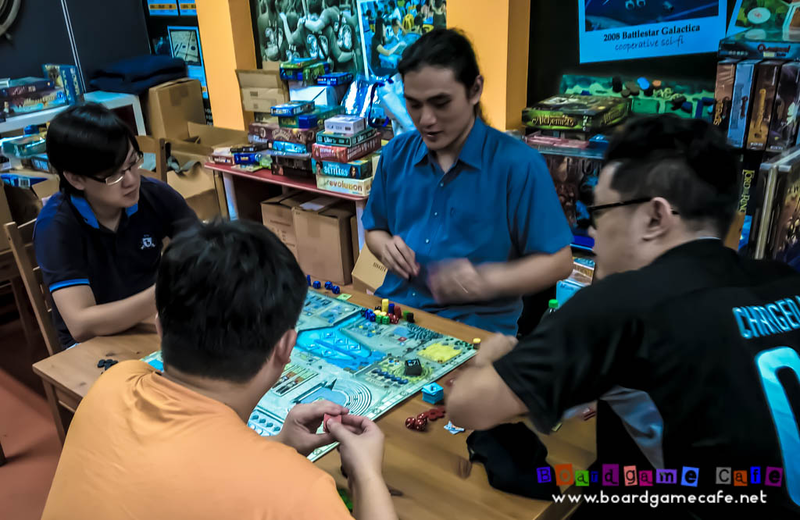 And it took us awhile before we’d the chance to bring this game for a run last Friday – we did a 5-player session. So it would be a good session to see if it’s broken as per the Essen session. The dice are your workers, and everyone starts with three value-2 dice. You also get a Leader (worker) which represented a worker with value-6. Higher values are better (more of this later). You also get two Titans (red square tiles), one Titan modifier (round red tile) plus one finished good (green tile). Depending on turn order, you get 4-6 wooden discs. These discs are your “currency” and you’ll use it when you need to “pay” for certain action or items. There are 10 different areas on the board (numbered 1-10) where you can commit workers for action. The value of the dice printed on the board indicated the minimum value of your dice worker to commit. 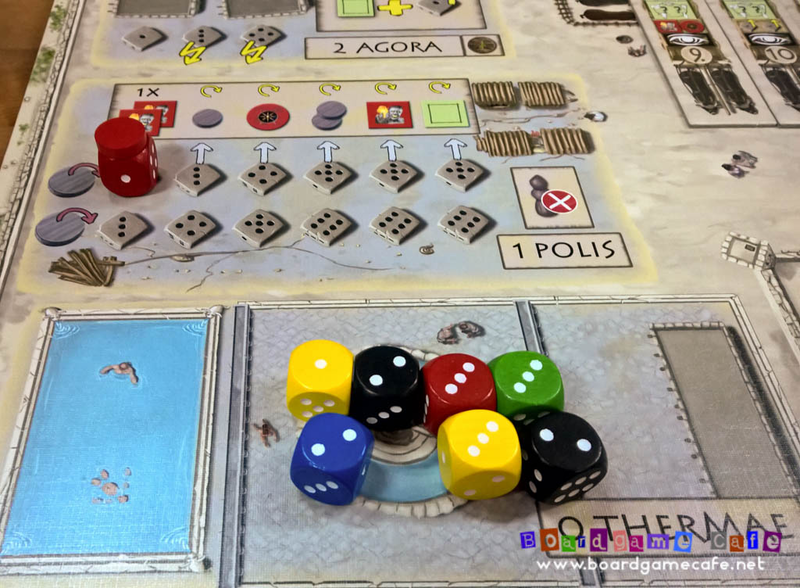 For eg the right-most dice in the AGORA section (on the left) showed a value-4 dice so you’ll need to send a value-4 or higher worker if you wish to take that particular action. Remember you also have one Leader who is equivalent to a value-6 dice; there are some restrictions where you can’t place your leader but generally they can be placed in most places where you can place a worker dice. 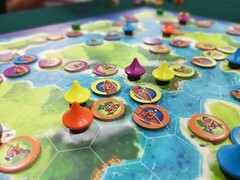 There are two other areas in the middle of the board – PORT and MERKATOR – these two are trading actions and do not need worker dice. Here you are basically selling your trade goods for VPs / money (in the form of wooden discs) or other favors (only if you trade in MERKATOR). Note: The “lighting” icon simply indicates the action – if chosen – is executed immediately (which is an advantage compared to actions which are executed at the end of the round). With three starting worker dice and one leader, you might think you actually get 4 actions per round – the game potentially lasts 8 rounds. Unfortunately antiquity Greeks like to slack. After being sent to perform an action, the worker dice needs proper rest – “proper rest” is defined as one full round of inactivity – in the THERMAE (hot bath) area. Which means you won’t get to re-use these worker dice until they are well-rested in the THERMAE for one full round. Ouch! So you have on average 2+ workers per round which is not a lot of actions and as such you do need to prioritize your plans. 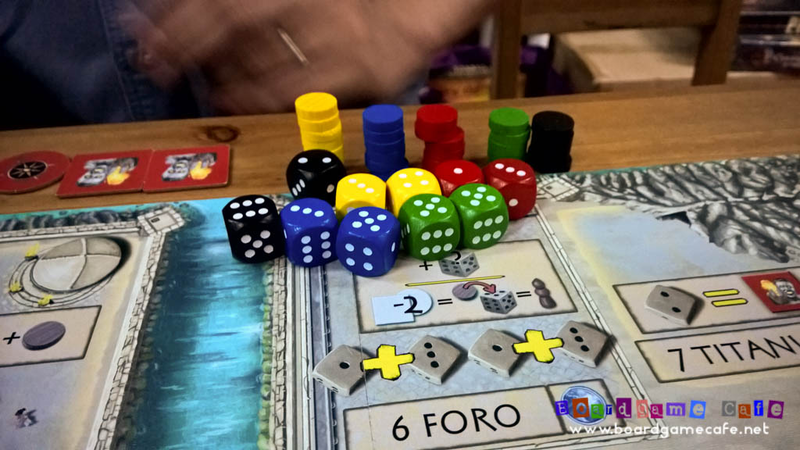 If 2+ worker actions are too few for you, the FORO area allows you to buy more worker dice. The cost is to commit two workers (with min 1+3 value) to extract an additional worker dice from the FORO to your worker pool. 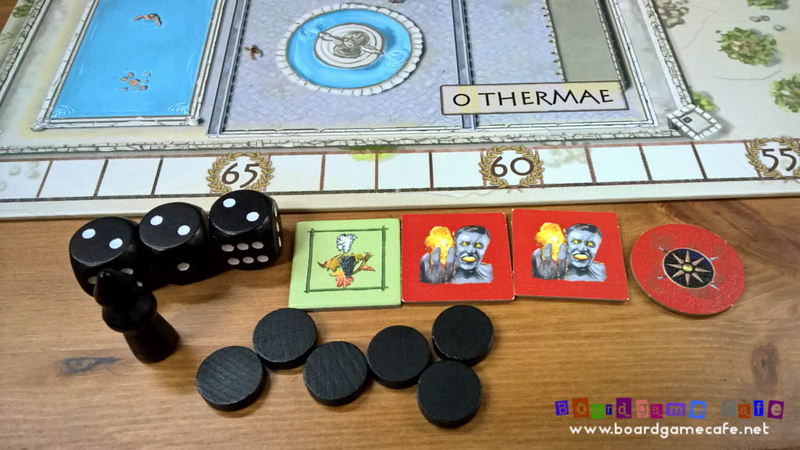 The “rest one round” mechanics of the THERMAE also meant you should not – unless it’s to your huge advantage – commit all three of your worker dice in one round. If you do that, you’ll have only your Leader to use as a worker dice in the next round. The “resource collection” part of the worker action is mostly on the left; here the AGORA allows you to pick up trade goods (green tiles), the PHALANX adds Titan modifiers (red round tiles) to your inventory. These Titan modifiers are very useful when sending out your Titans to fight as they not only augments the combat strength of your Titans, they also allow you to change the base element of the fighting terrain to suit you (more of this fighting stuff later). Lastly – not forgetting that in spite of all these talks of fighting & underworld – one needs to continue to pursue the cultural side of life; the ART forum allows you to hire Artisans. They are basically personality tiles where you can pay (using wooden discs) to activate certain privileges for eg converting a basic trade goods into a finished goods (giving you twice the payout when you trade them at PORT). The AGORA and ART areas help feed your trading objectives. 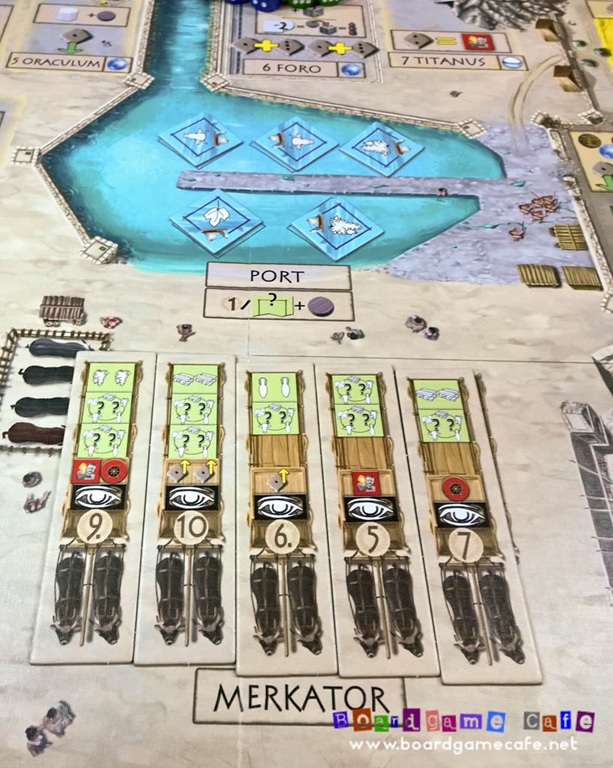 You have two options; either sell the trade goods quickly via the PORT area or collect the right set of trade goods and trade them to fulfill contracts in MERKATOR. The PORT sales merely gives you some VP and quick money (one wooden disc per sale) and it’s the MERKATOR contracts that offer more lucrative returns. However MERKATOR only accepts finished trade goods (and AGORA only dispenses basic goods) so to get in play for MERKATOR, you’ll need to also pay some visits to the ART area, namely to acquire Artisans to upgrade your basic goods to finished ones. Bearing in mind you have limited worker actions each round, one needs to weight the gains vs lost momentum by visting AGORA-ART-MERKATOR too frequently. The contracts in MERKATOR do pay out good VPs (above: the left most MERKATOR contracts pay out 9VP and 10VP in addition to other benefits) so that might yet be your path to victory. I suppose in the Essen game Kaz observed, all 5 players were focusing too intently on trading/selling/contract – at the loss of not engaging in Titan fights – which conspired to drain out all the goods tiles by late game rounds. This was probably not the intention of the game from Bernd’s perspective and partly not enough playtesting on this trade/sale only type of play to mitigate this issue. Bernd updated the Errata/FAQ to suggest if your session is found in that situation, to consider re-shuffling all the discarded/used goods tiles back into the game. Ah.. the TITANS which is the underlying theme of the game. Building up your own Titan force to suppress those annoying Titans coming up from the Underworld. The Underworld Titans came at us thru the KRYPT and at the end of each round, there’ll be one we all have to fight (individually – there’s no cooperative element here. Each of us either fight the Titan ourselves or our village pay losses). 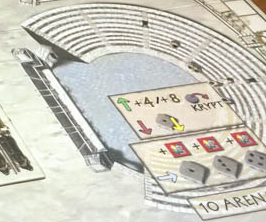 The battle at the KRYPT is the 2nd last action area to resolve (the last being the ARENA where player’s Titan attacks other player, hehe) and the Underworld Titan in the KRYPT is measured in two areas – combat strength and fighting element. Combat strength is simply the number on the Titan token (in above eg, the Titan comes with base strength of 8). You also need to add the round’s combat modifier to the base combat strength. The combat modifier can range from 1 (in early rounds) to 5 in the late rounds. In above eg, the round modifier was 1 so the Titan’s total combat strength is “9”. Next, you need to look at the fighting element of the Titan. He may fight in one of the four elements – earth, fire, water or air – and you need to send the “right element” Titan to match him, besides equalling or besting the Underworld Titan in combat strength. If you send in a Titan with a wrong fighting element, he’ll lose no matter how strong his combat strength is. WIN the battle and your village need not suffer any loss plus you get to take home some VPs (as shown on the Titan token). Chose not to fight the Titan, and you need to sacrifice a wooden disc to the KRYPT. You might think, ah it’s just one disc – take mine, I have plenty. Dropping a wooden disc into the KRYPT has a few implications. Firstly you lose (permanently) the wooden disc. While we’ve 12 discs in our pool and there are actions where we can send in workers to get more discs, in practical terms they are “expensive to come by”. 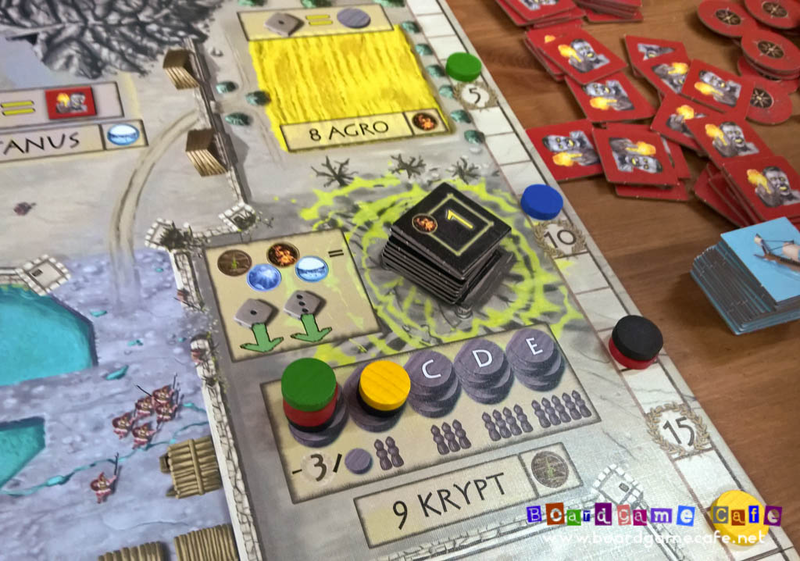 Secondly adding a disc to the KRYPT helps to hasten the end of the game. 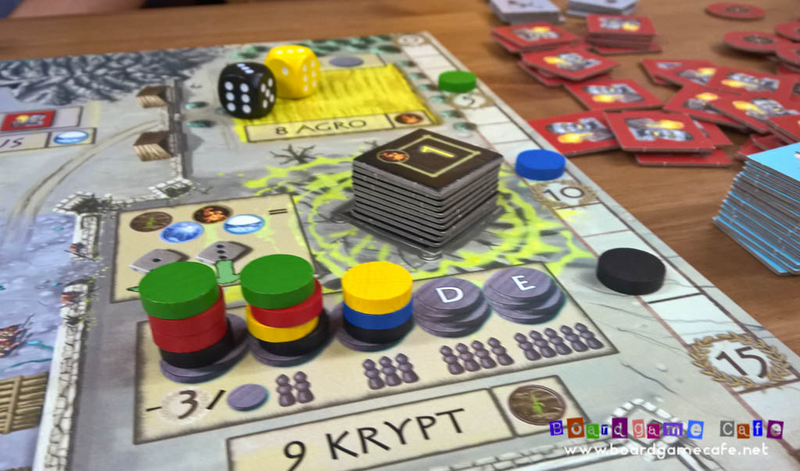 In a 5-player game the KRYPT can only take 20 discs (from all players) and once the 20th disc is placed on the KRYPT, the game ends prematurely (a full game would last 8 rounds) as it’s assumed the Titans from the Underworld has overran our world. As a penalty, each disc of yours in the KRYPT would result in a –3 VP loss. Ouch. A premature end of game (due to disc overrun in KRYPT) won’t trigger any other bonus or end-game scoring. Your current VP (minus the 3 VP penalty per disc in KRYPT) is all you’ll be scoring. Therefore a premature end of game favors one who has been aggressive fighting and defeating Titans in either the KRYPT and/or the ARENA. The trader-players who were patiently harvesting trade goods from the AGORA, waiting to get the right Artisan from the ART and then trading them up at the MERKATOR won’t get enough ramp-up time to be in contention if the game is ended in a premature manner. What’s the ARENA? It’s the last worker placement resolution area; and one where if you place a worker here you can challenge any other player to a fight in the Arena. Instead of sending in gladiators, you send in Titans. 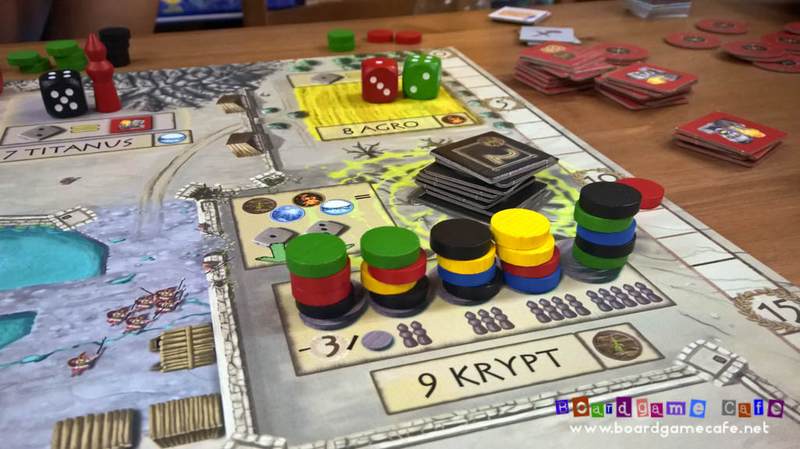 The winner gets to pocket 4 or 8 VP (the 8 VP gain would require a disc sacrifice into the KRYPT, further hastening the game to a premature end) and the loser downgrades one of his worker dice (to one value lower). You do not have to fight even if you are challenged but that would mean you are handing over 8 VPs to the challenger. Being meek is not the way to play Panthalos. It does not mean you attack every single moving thing here but you certainly need to be able to stand up for yourself and to mobilize a strong Titan force to either repel the Titans from the Krypt or defend yourselves in the Arena. Back to the KRYPT. From my earlier description, you might also wonder, why would someone NOT fight the Underworld Titans (unless if one does not have a superior Titan of the same element). Becoz sending Titans out to battle can be expensive. You won’t have many Titans and after each fight, regardless of whether you win or lose, the Titan would take his leave…. unless you are willing – and have spare – to pay one wooden disc to keep one Titan. I did say these wooden discs are scarce commodity. This trade-off makes one choose your battles selectively. Sometimes the KRYPT turns up some annoying Titans. Example above.. a 1-combat strength Titan of the Fire element (with no victory VP to be gained even if you best him). In this case, you need to decide what’s the best course of action for you… send one of your Fire Titan to vanquish him (almost any Titan would since this is a weak 1-strength dude) but you gain nothing for the effort, not to mention you may need to spend a wooden disc if you wish to retain the services of the Titan you just sent to fight this. Or just gave up and drop a wooden disc to the KRYPT but that only serves to hasten a premature game end (though that may be what you wish for). 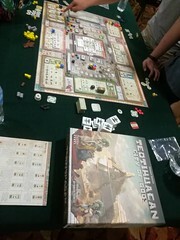 Our session ended the premature way – and it was in Round 6 when it happened so the trader-players would be short of 2 rounds to be able to enjoy their end-game bonus VPs. Blue above has a distinct advantage since he has only 3 discs in the KRYPT and stood to lose 9 VPs while most of the rest have 5-6 discs and would lose 15-18 VPs. If you have not been collecting strong VPs from earlier fights in the KRYPT or ARENA to offset this penalty, you wouldn’t have stood in a strong position at this stage. 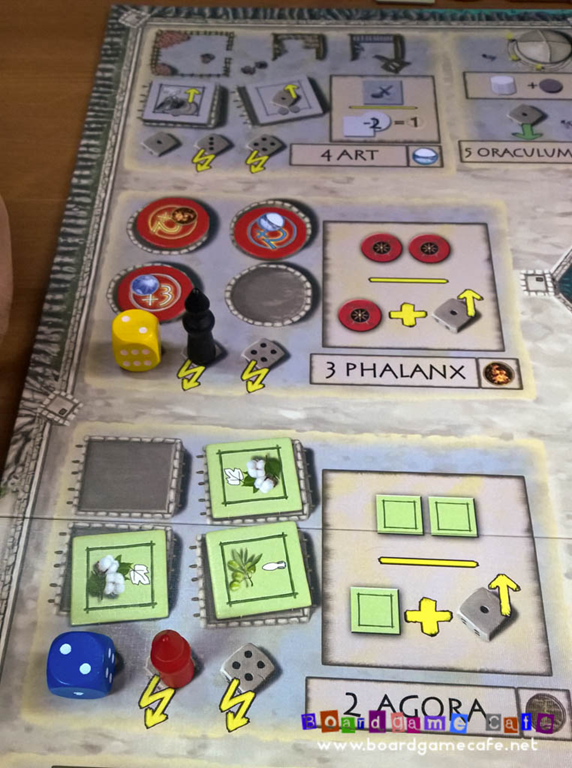 If you like Bernd’s other games (Peloppones, Pergammon, etc) you would certainly like PANTHALOS. I would rate this as his better games among the others; a most expansive design approach to the game. 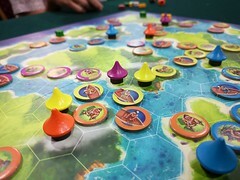 It still features his trademark limited action/option and plays very tight since the two key resources for this game – worker dice and wooden discs – are scarce commodities in game play. 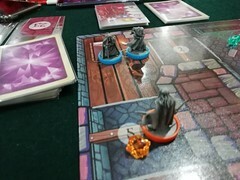 We did a 5-player game and I would think a 4- or 5-player count is the best since this game thrives on confrontation; whether it’s with the Underworld Titans or with the other players especially in the Arena. We all think that’s how Bernd intended for this game to be played; and not as a pure goods trading game (which explained the skewed direction the game in Essen took). An aggressive approach via Titans – and obviously you also need to win the fights you are getting into – would always be an advantage as it’s easy to rush the game to a premature end via the KRYPT playing to the aggressor’s advantage. This game plays quick; it’s rated 75 min and we think it should not be a longer-than-90-min game so we’ll hope to get it back to our tables soon. 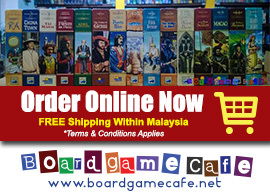 The downside with this game – and all Iron Games titles – is that it’s not easily available for us to pull into Malaysia so it’s not widely available unless one seeks to procure a copy direct from Iron Games or thru some of the Boardgamegeek sellers. More pictures of this meetup session from our Facebook photo album (below).